During grade school, I read in one of Filipino textbooks the origin of mango fruit. The legend says that there was a very kind young girl who was more than a good Samaritan. She helped many sick people, fed hungry beggars, and helped the elderly and the forsaken in ways she can. The townsfolk deeply respected the girl, whom they believed possessing a golden heart. One day, the girl got sick and later died. The whole town mourned her death. Her remains were buried in her backyard. Years passed, a tree sprouted from her graveyard, and produced many heart-shaped, golden yellow fruit – a reminder of her lovingkindness. I really love mangoes more than any other fruits. Here in my hometown, our old backyard has 3 mango trees, probably half a century old. When I was 10, I remember our kitchen filled with big baskets of harvested mangoes from these trees. I couldn’t wait for them to ripen. I was always the first one to sneak and eat the ripe ones. That was almost two decades. We have not harvested that much from our backyard trees since then, but just last year my cousin and his friends managed to get a bag full of mangoes. I tasted again their ripe sweetness. But I still keep on buying mangoes from our neighborhood’s regular mango vendor from time to time. Mangoes bring life to our dining table. Just a week ago, my partner Claire and I went to Guimaras, about 15 minutes by boat from Iloilo City. Guimaras is a huge island with peace-loving and industrious people. I was excited to come to this paradise, for it was famed for producing the sweetest mangoes in the world. We had Guimaras mangoes for breakfast the next day. True enough, it was the sweetest mango I ever tasted. We wondered its secret, and good thing we dropped by at the National Mango Research and Development Center and learned more about the mangoes through Ms. Helen G. Bignayan, senior agriculturist/research coordinator. Finally, we were able to hear the story of Guimaras mangoes from her scientific perspective. 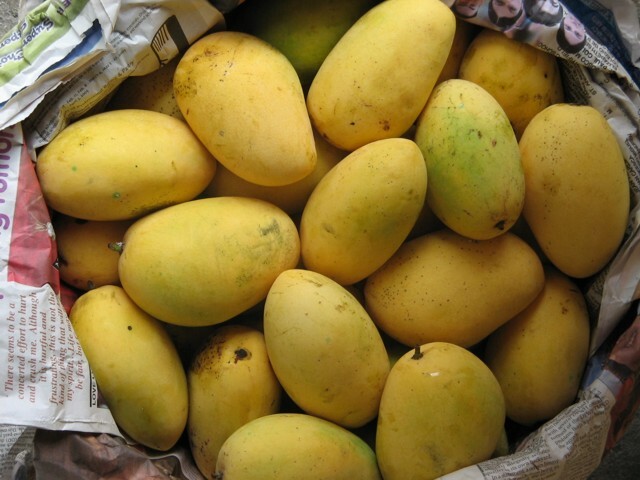 One thing I have learned about mangoes was striking – the mangoes must be mature before harvest. According to Ms. Helen, since mangoes are highly demanded commodities, some farmers speed up the process by harvesting them before maturity, then ripen them by putting a substance called kalburo (calcium carbide). The result is a yellow mango but not yet mature and ripe. Such practice often jeopardize Guimaras’ mango industry, and the local government is quite strict on implementing policies. Along with that, Ms. Helen and the rest of the experts continue to educate farmers so we can still harvest the world’s sweetest mangoes . Love is found in the most unlikely things, and mango is always one of them. Learning the story of Guimaras mangoes is a jumpstart for me to see how mangoes are symbolically significant in understanding Love. More than a legend, Mangifera indica is an image of a golden heart, symbolic of unconditional Love. Mangoes take their own natural time to mature. Likewise, Love needs its natural pace to completely ripen. It is possible for our human hearts to hasten our expressions to Love, but we might still sense a sour attempt. When we wait for our hearts to mature, we let it glow into its true golden state both inside and outside, and we can now unfold its sweet expressions. Love, like mangoes, needs to mature. This is the secret, and we must be aware. Despite the outside forces that might deter us, we can choose to cultivate this Love and consistently protect it. And within us is a seed of Love that will bear infinite sweetness of Love. So for every mango served at your tables, remember the virtue of Love it tells. Love is found in the most unlikely things, and mango is always one of them.